"She's been alive for two weeks now, but we still haven't seen her face. Our baby wakes up to the sound of beeping machines and goes to bed with an oxygen mask. I'm afraid this might the only life she will ever know." The past two weeks have been an uphill battle for Sumalatha, Mahendra and their newborn baby girl. During her 7th month of pregnancy, Sumalatha experienced a slight pain in her stomach and noticed that her water was leaking. She underwent an immediate C-section, but unfortunately, her baby girl’s life began in distress. With extremely low birth weight and breathing problems, she was immediately rushed to the NICU. Only 3 weeks of stay in the NICU can ensure that this baby lives to see a future. 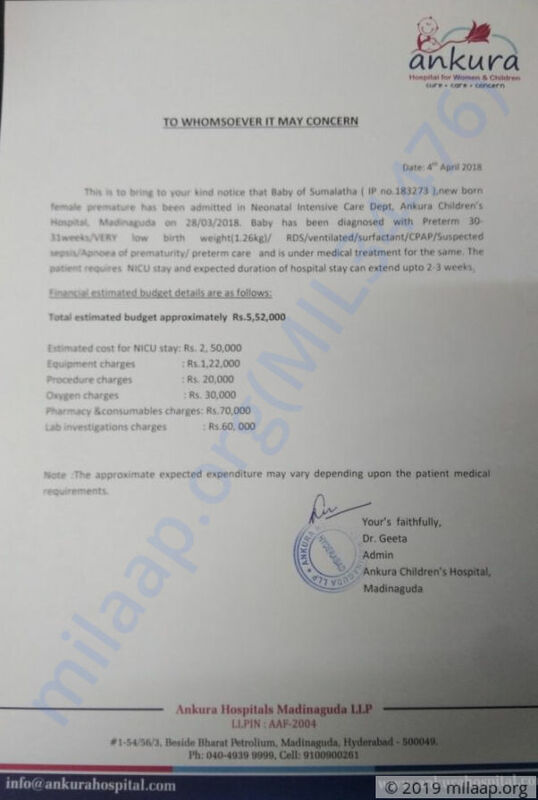 Sumalatha’s baby was born prematurely at only 1.3 kgs. Her weight only began decreasing after her birth, and every breath was a struggle. She was quickly placed on ventilator support. With continued medical care, the baby is now off the ventilator but still needs oxygen support every night. 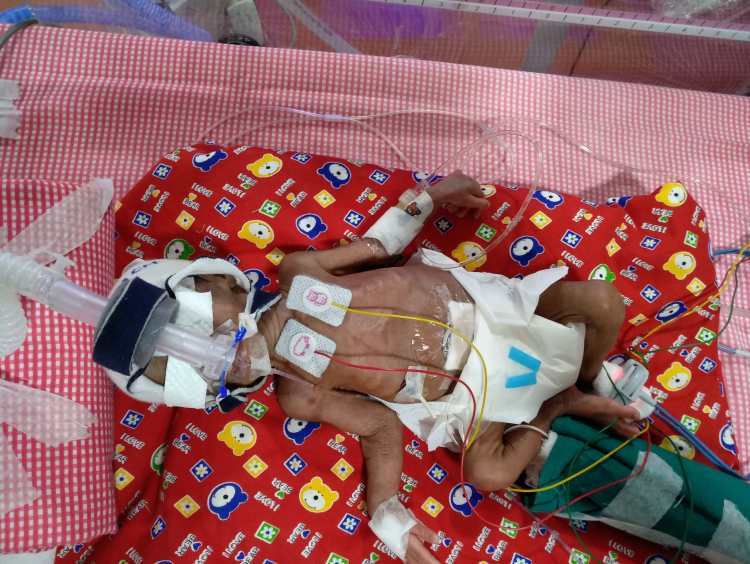 The baby girl has respiratory distress syndrome due to her underdeveloped lungs. If left untreated it can cause multiple organ failures, and the most devasting thought for her parents - death. 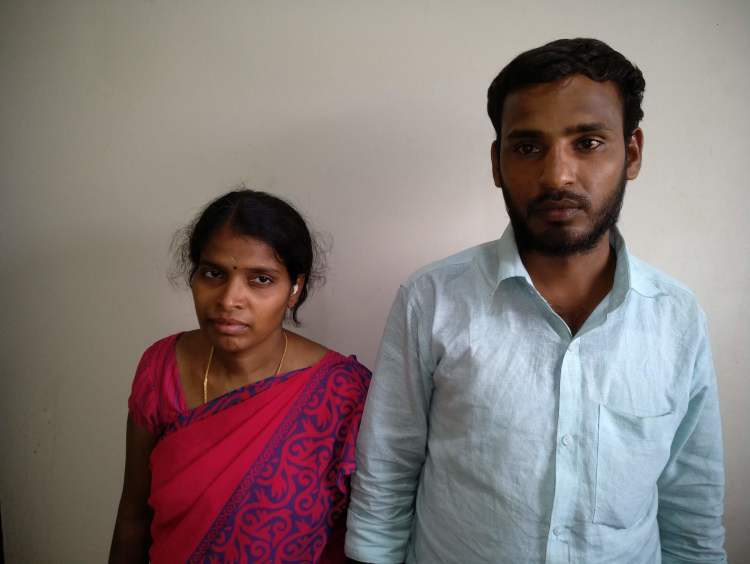 Mahendra and Sumalatha have spent nearly 2 lakhs for their baby’s treatment so far. Mahendra’s salary as a labourer isn’t enough to pay for the increasing medical bills, and they were forced to borrow from family members. Now, they’re neck-deep in loans and can’t pay them off or afford the 5 lakhs needed to save their baby. Their baby girl has made it so far and will only get stronger with medical care. Each day that she gets treatment, she’s coming close to being healthy. She needs your help to continue getting the life-saving treatment. The only chance that Sumalatha’s baby has is to stay in the hospital for the next 3 weeks. It’s not too late to save her and give her a better future, but her parents have nothing left to continue her treatment. They are emotionally and financially strained and are desperate to find a way out of this nightmare. 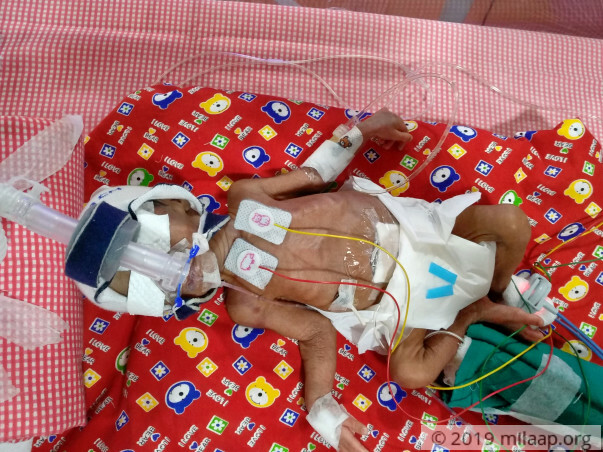 Your support will save Sumalatha’s baby girl’s life. 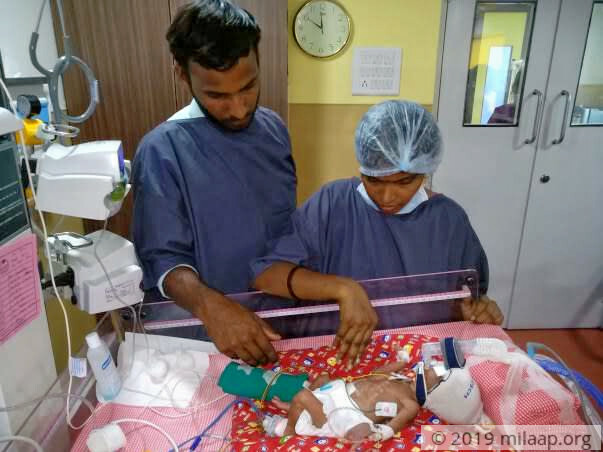 Baby, due to its preterm condition was given extra care in NICU. Baby improved gradually and respiration also stabilized. Was slowly started on tube feeds and now on direct mother feeds, Baby is discharged and doing well at home. Thank you for the support. Sumalatha's baby is weaned off oxygen support and maintaining saturation at room air. The baby is tolerating feed well and has shown a mild increase in weight. 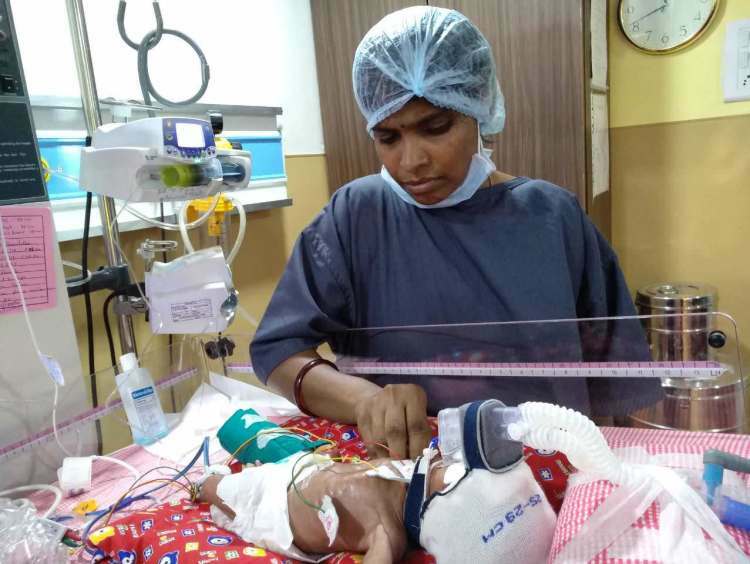 Unfortunately, the baby has developed hydrocephalus, a condition where there is an accumulation of CSF, Cerebrospinal fluid, a clear fluid in the brain. This requires periodic tapping of the CSF and a shunt will be planned at a later date. Thank you all once again for all the wonderful love and support that you have shown towards Sumalatha's baby. Please do pray for her health and speedy recovery. Will keep you posted. Here is an update on baby's health. 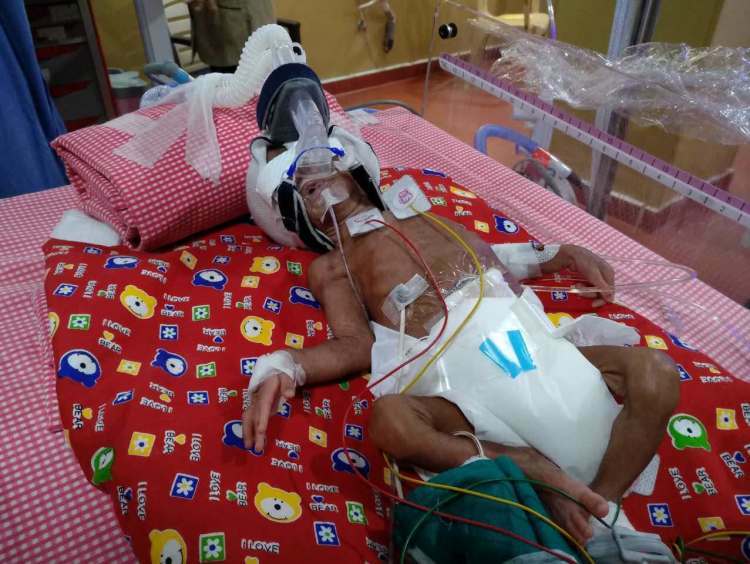 Baby due to its prematurity developed brain bleed (intraventricular hemorrhage grade 2). Baby is on continuous medication to prevent any complications due to the bleeding. Baby seems to have developed necrotizing enterocolitis (an Infection in the intestine). 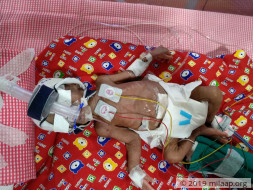 Please pray for baby's health. Get well soon, good bless you.